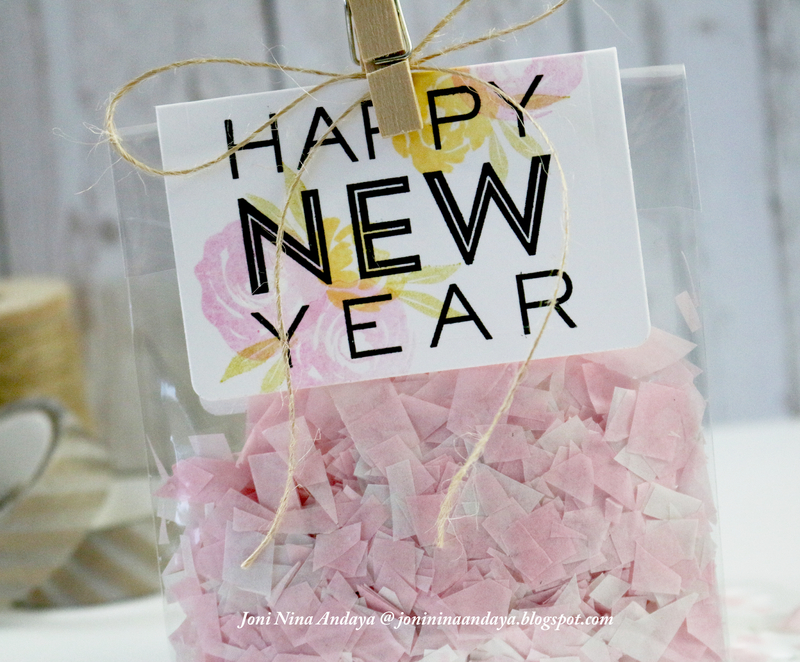 Papell with Love: Happy New Year!!! 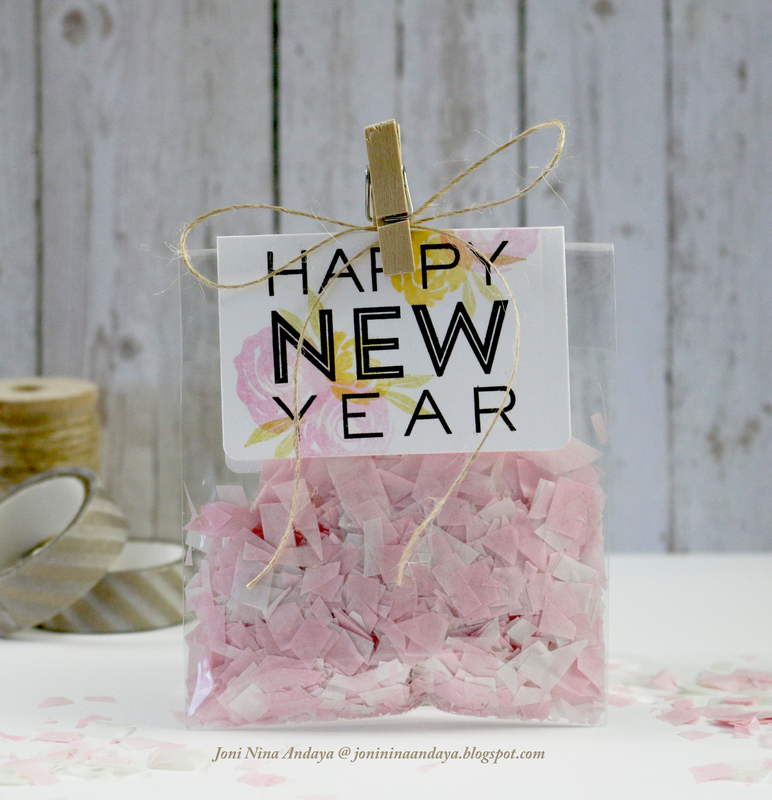 I know how we love confetti, for this post I will show you how to create your own using the things you might already have in hand. 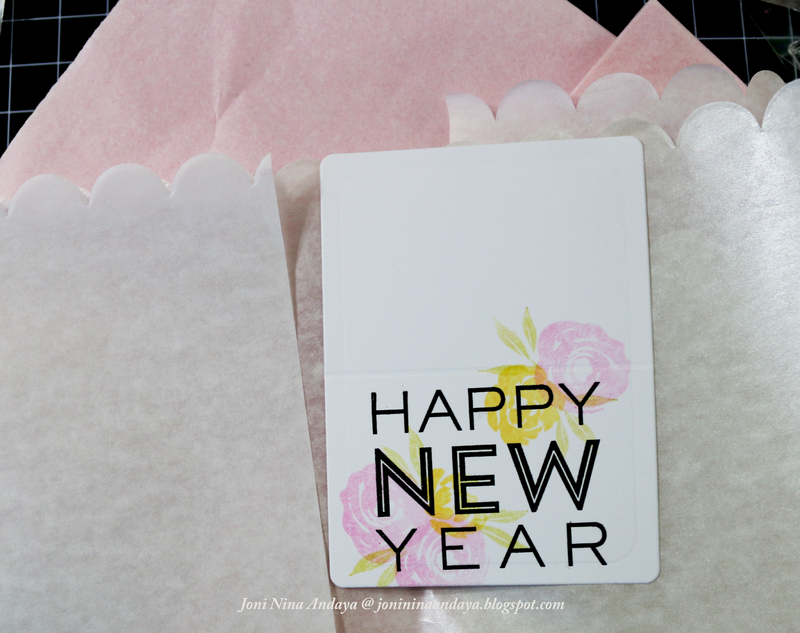 Wplus9 Twenty Fifteen stamp sets, Pretty Little Peonies stamp sets, and Clear Cut Stackers: Rounded Rectangles. To begin my project, I first die-cut the rounded rectangled piece using the Clear Cut Stackers: Rounded Rectangles. Then stamped the sentiment "Happy New Year" from Twenty Fifteen stamp set and added the flowers from Pretty Little Peonies stamp set. 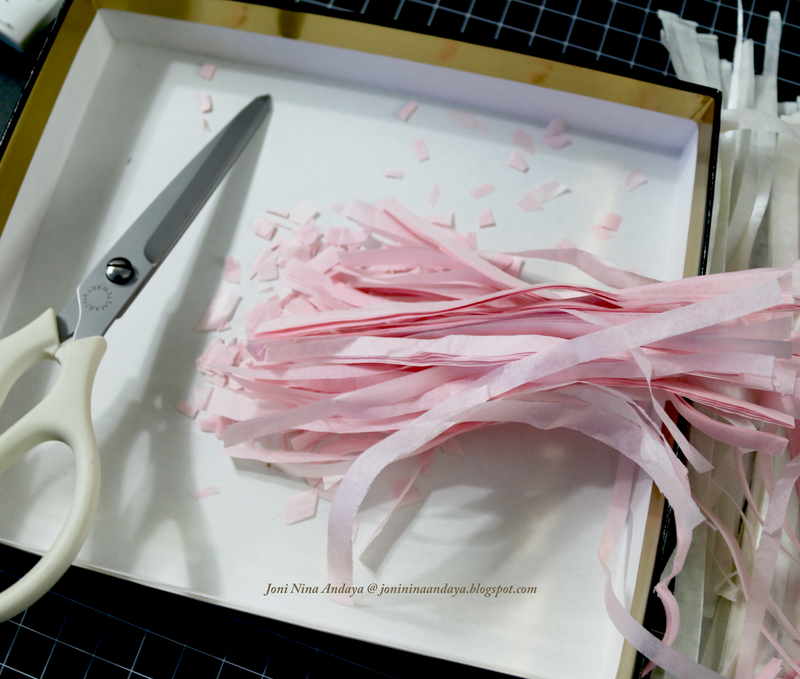 Next, I cut the strips of tissue paper first on my Tonic paper cutter for fast cutting. I simply stacked some pieces of tissue paper since they are very thin and cut. Next, I bunch the strips on my hand and cut, just make sure you have a box or some container to catch all your paper goodness. To finish off I put the cut confetti on a clear cellophane bag that I got at my local crafts store. I created a bow from twine, scored the stamped rectangled panel, and clipped the clothes pin on top. that is a fun idea!! cute colors! What a treat to browse your blog and catch up on your awesome creations! Thanks for all the talent you've shared this past year. I'm looking forward to more of your inspiration in 2015! Happy New Year! Much more fun with confetti! Love love love this! So fun!!!!!!!!! So fun and cute, Joni! Have a Happy New Year! I love this idea,and the pink is so pretty! Next time we do a party I will remember this. Off to look at all the post I missed of yours,I see them on FB . Hope you have a blessed 2015,Joni! Simply delightful Joni!! Have a Happy New Year! Fablous and chic project, I love this and such and easy and fun way to package! So pretty! Happy New Year Joni! What a wonderful idea, dear Joni! What a FUN project, so festive! So pretty and awesome project :) Hope u have a very Happy New Year ! So clever and beautiful too! Thank you for all your glorious inspiration in 2014! Reverse Confetti December 2014 Blog Hop! Wplus9 - 2014 December Release!